In this memoir by the first woman to row solo across the Atlantic Ocean, Tori McClure finds that what she is looking for lies not in a superhuman show of strength, but rather in embracing what it means to be human. "In the end, I know I rowed across the Atlantic to find my heart, but in the beginning, I wasn't aware that it was missing." In June 1998, Tori McClure began rowing across the Atlantic Ocean solo in a twenty-three-foot plywood boat with no motor or sail. Within days she lost all communication with shore but decided to forge ahead -- not knowing that 1998 would turn out to be the worst hurricane season on record in the North Atlantic. When she was nearly killed by a series of violent storms, Tori was forced to signal for help and head home in what felt like disgrace. But then her life changed in unexpected ways. She was hired by Muhammad Ali, who told her she did not want to be known as the woman who "almost" rowed across the Atlantic. And at thirty-five, Tori fell in love. 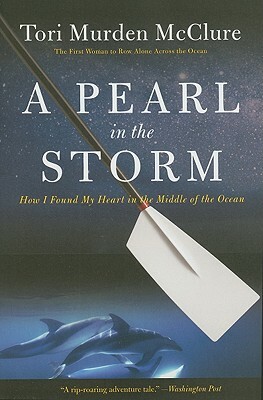 A Pearl in the Storm is Tori's thrilling true story of high adventure -- and of her personal quest to discover that embracing her own humanity was more important than superhuman feats. A vice president at Spalding University, Tori Murden McClure's firsts include being the first woman to row solo across the Atlantic and to ski over land to the South Pole. She holds several degrees, including a master's in divinity from Harvard University. Tori lives in Louisville, Kentucky, with her husband.